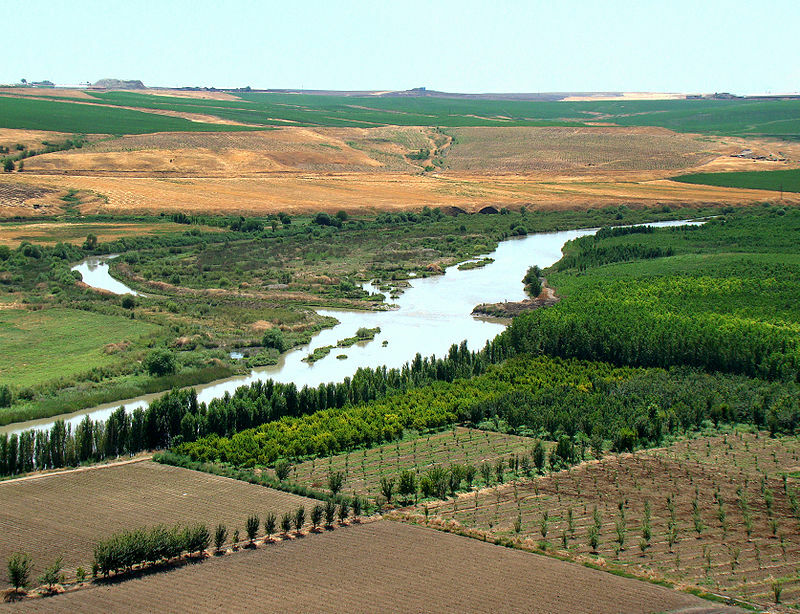 Tigris River outside Dyarbakir, Turkey. photo: Bjorn Christian Torrissen. Mesopotamia, which means “land between the rivers” encompassed the fertile geographical area between the Tigris and Euphrates rivers in present day Iraq and parts of Syria,Turkey and Iran. Referred to as the “cradle of civilization”, it gave rise to a succession of cultures—the Sumerians, Akkadians, Babylonians, Hittites, Kassites, Assyrians, and Chaldeans before finally falling to the Persians in 539 BCE. Mesopotamia was inhabited long before the rise of these historical civilizations however. Paleolithic hunter-gatherers lived in the Zagros mountains and sporadically dwelled in the lowlands until the end of the last Ice Age around 10,000 BCE. 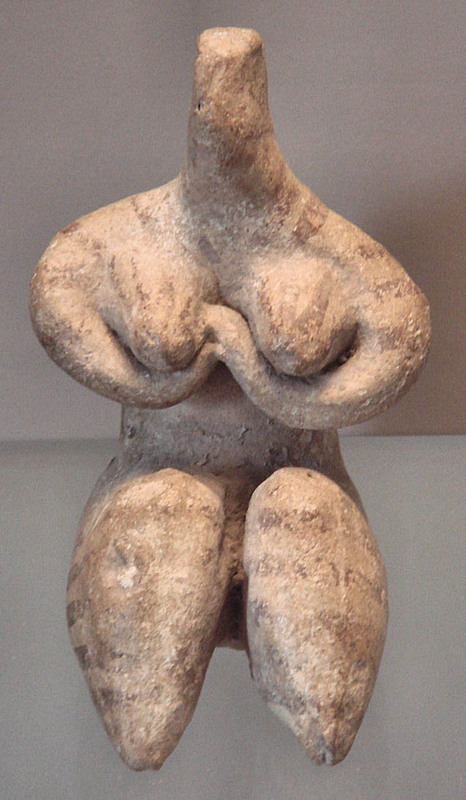 Female statuette from Samarra. 6,000 BCE. Louvre. Around 7,000 BCE, Neolithic settlements based on agriculture such as Jarmo, Samarra, and Tell Halaf arose in northern Mesopotamia roughly during the same period as the cities of Jericho in the Levant and Catalhoyuk in Anatolia. The first farmers settled in southern Mesopotamia around 5,400 BCE bringing with them the Samarran culture from the north. They built mud-brick buildings and canals using sophisticated irrigation methods which allowed them to practice agriculture in the marshes of the Euphrates river. The city of Eridu was established close to the Persian Gulf and the mouth of the Euphrates River. The Sumerians are found there around 3,500 BCE during the Uruk period. Eridu in Sumerian means “mighty place”, an appropriate name for the seat of the first kings of Mesopotamia. Soon after its founding, other Sumerian cities such as Ur, Uruk, and Larsa were established—the world’s earliest “city-states”. The origin of the Sumerians is a mystery and most linguists insist their language is unrelated to any other, though some words in Sumerian vocabulary bear similarities to Eurasian languages, possibly the result of early contacts between cultures. Assyriologist Samuel Noah Kramer aptly titled one of his books History begins at Sumer, noting that the first system of laws, taxes, as well as love songs were recorded there. The Sumerians are also credited with revolutionary inventions such as writing, mathematics, the calendar, kingship, wheeled carts, and metalwork with bronze which laid the foundations for civilizations to follow. Standing male worshipper. Alabaster, shell and limestone. 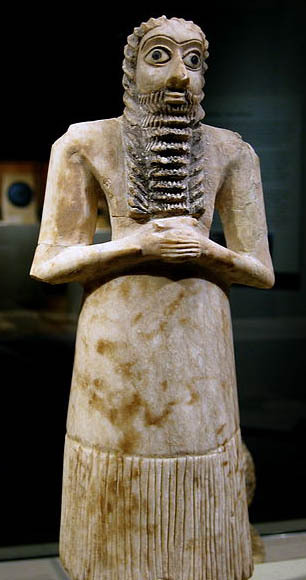 Sumeria 2,750-2,600. BCE. photo: Rosemania. The earliest towns in Sumer were agricultural settlements which grew up around temples of a local god. These eventually expanded into city-states in which private property, a class system, and governments ruled by elites were established. The earliest ruler was a religious leader—the en—who was in charge of the city’s temple, a role that was later assumed by the sacred king. The king however owed his authority to the patron deity believed to rule the city, whom he served as vice-regent. He needed to continually discern the will of the ruling god or goddess, surrounding himself with priests who specialized in divination, religious ritual and magic to assist him in this task. The sacred kings of Mesopotamia, and their supporting priesthoods, became the mediators to the divine world—assuming roles similar to those of shamans in tribal cultures. The shaman’s symbols and powers as well as his duties now fell upon the king, according to historian Thomas McEvilley. The stories of otherworldy exploits of shamans of the past were retold as myths of the kings of the city-states, legitimizing their spiritual authority. In the Epic of Gilgamesh, the king of the city of Uruk, Gilgamesh, is given a magical drum made from the mythical Huluppu Tree, similar to the Siberian shaman’s drum made from the World Tree. In another story Gilgamesh descends into the underworld in his quest for immortality, traveling through a long, dark tunnel before reaching the garden of the gods. Likewise the goddess Inanna descends to the underworld where she is killed then magically resurrected, reminiscent of shamanic initiations. 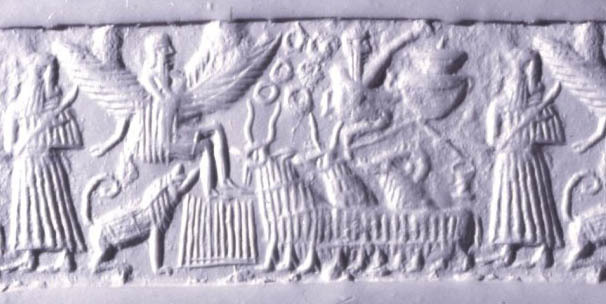 Akkadian cylinder seal of Etana carried to heaven on an eagle. 2,250 BCE. British Museum. A celestial ascent occurs in the Epic of Etana where an early Sumerian king flies to the heavens on the back of an eagle in search for the “plant of life”, similar to the visionary journey of the tribal shaman who ascends to the sky with the aid of his animal helping-spirit to gain healing remedies. Mesopotamian deities and kings were associated with the bull as totemic beast, wearing crowns of bull horns symbolizing their authority. The bull was also a common spirit-helper of shamans, first appearing in Paleolithic cave paintings of men shapeshifting into bison. All these myths and symbols have parallels with shamanistic narratives and mythic motifs as discussed in previous posts of this blog. 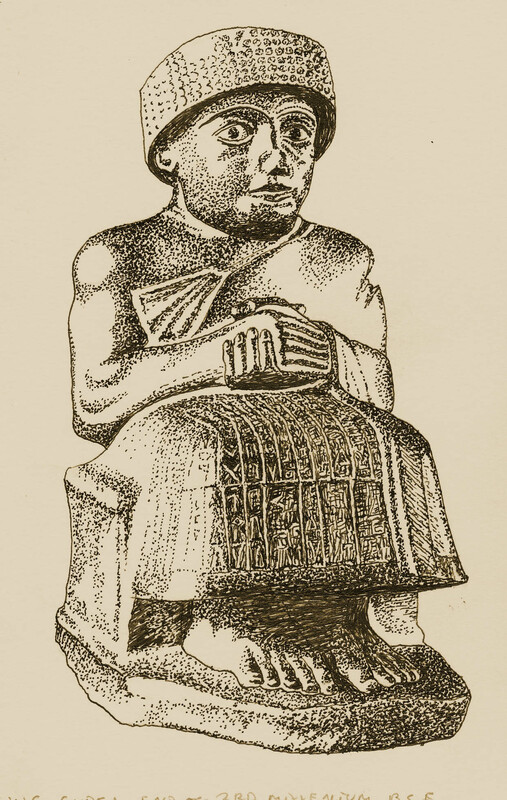 In subsequent dreams Gudea was even given specifications for the size of bricks to be used. He ritually made the first brick and supervised the building of the temple. According to McEvilley: “he was functioning like a medium or shaman who communicates directly with the deity”. The Mesopotamian king became responsible for sacred dreaming as a way of communicating the intentions of the gods, his dreams interpreted by priests and diviners.